Muscles are a band or bundle of fibrous tissue that has the ability to contract, producing movement in or maintaining the position of parts of the body. Skeletal – Moves your body and stabilizes joints. Cardiac – Myocardium, the heart muscle, pumps blood throughout the body and supplies nutrients, including Oxygen. Smooth – Non-striated muscle supporting our organs and digestive system, keeping us functioning. Life: Our heart powers circulation of blood and the Diaphragm assists with breathing. Digestion: Smooth muscles in the bowel. Locomotion and general function lift, push, pull, work, walk and run. Pump Lymphatic system to cleanse the body of toxins and waste. Eat REAL food for recovery! Don’t smoke! Keep lungs, blood vessels, and nerves healthy and full of Oxygen rich blood cells. No. Fat takes up more space, but remember a pound is a pound. Thus, a pound of feathers weigh as much as a pound of bricks. No. When you stop utilizing built up muscle mass, those muscles atrophy, but do not turn into fat. Yes and no. The muscles don’t go away, but as you age you begin to lose muscle mass and function through a process known as sarcopenia – your muscles get smaller and weaker with each passing year particularly after about the mid 30’s – at the rate of about ½ to 1% per year. 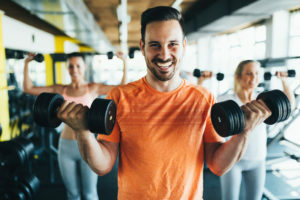 As we age, it just becomes more difficult to maintain or build muscle due to the decrease in hormones, such as testosterone, as well as the slowing of other metabolic functions of our body. Acute bouts of inactivity such as 10 days of bed rest in older adults can substantially reduce leg strength, reduce aerobic capacity by 12% and lead to a 7% reduction of physical activity after the bed rest programme (Kortebein et al. 2008). ONLY do this if you know you can get back up! Lift Weights – the best way to slow down or even rebuild loss muscle strength is by lifting weights. As we get to ‘old age’ the formula is more repetitions with lower weights. In fact, weight lifting should be a part of everyone’s healthy lifestyle, particularly in our retirement years.